Is throwing up normal after getting a tonsillectomy? One of the more unpleasant symptoms experienced by patients after tonsil surgery is moderate to severe nausea. Throwing up, or vomiting, is never a pleasant experience, but during tonsillectomy recovery it can be terrifying and extremely painful. The throat tissues, already sore from the surgery, certainly don’t benefit from stomach acids passing over them. Furthermore, repeated vomiting can potentially cause hemorrhaging in the tonsil bed. While nausea and even throwing up, is common during tonsillectomy recovery, it doesn’t have to be. 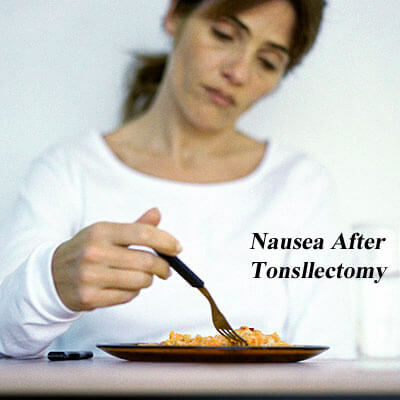 What causes tonsillectomy recovery nausea? Initially, the drugs from general anesthesia are to blame for the woozy feelings and upset stomach post tonsillectomy. Most patients are prescribed narcotic medicines for pain management during their recovery. These medicines can also cause feelings of nausea. So what is to be done to prevent or treat these unpleasant and potentially dangerous side effects? The good news is that there are many anti-nausea medicines available. It’s best to ask your doctor before surgery about these options. Lisa – The same thing happened to my daughter. The doctor gave her a Phenergan suppository and she was a million times better the next day! Yolanda – I didn’t start throwing up until day 6. when I went to the Dr they gave me phenergan but in a gel form that I rubbed on my wrists. that way I didn’t throw up the medication. it worked great. Jessica – Same exact thing happened to me. 2 days after the surgery I was throwing up. Doctor ordered some Zofran which helped but I was still miserable. For me personally, it was the pain meds on a mostly empty stomach. Once I was feeling better, I would eat something (bread, scrambles eggs, mashed potatoes- all plain) and take my pain meds right after. It helped calm down my stomach a lot. Brandi – I started throwing up the night I had my tonsils out. Dr. called me in Phenegran suppository. They worked great – that was the only time I threw up during the recovery period. Vickie -My son, 11, just had his tonsils and adenoids out. He threw up on the way home from surgery and a couple times that night. Started the suppository anti-nausea the next morning, and that stopped the vomiting. He was still nauseous and down and out most of that day, day 2. Then in the middle of the night/early morning on day 5 he started vomiting again. At first, the nurse thought the initial vomiting day1/2 was from the anesthesia, but after this happened on day 5, they are thinking he didn’t tolerate the hydro well. Anyway, on day 5, I got super worried…He was very lethargic, pale, and couldn’t keep fluids/meds down. Of course it was a Saturday and the doc was now also out of town. The on call doc called in a steroid as a last resort. Said if didn’t stop vomiting by later that afternoon to take him to the ER, because he was probably lethargic/pale due to dehydration. Anyway, he did stop vomiting. I am sure it was because the suppositories we started giving worked and not the steroid. I was desperate, though, and gave the steroid because the doc said so. Not sure why he offered that. Jina – Zofran worked for me plus try to get something in your stomach before taking the pain pills. The pain pills are hard on your stomach! Jazmine- So here’s my experience they had me on oxycodone which I was taking without antinausea medicine and was in the third day I had gotten very very sick and was throwing up hurt so bad, so comfortable also itching very badly so they switch me to hydrocodone which is better I do still feel sick to the stomach and do not feel all that great but it’s a lot better than what I was. Day of surgery I was throwing up everything I drank. Couldn’t keep anything down but later that night around 3 am I felt amazing. Went back to sleep only to wake up at 11am feeling the weakest I have ever been. Ended up losing 8 pounds in 1 day. Currently the day after surgery and I feel terrible, zofran definitely does not help me at all. MASTIC GUM FOR NAUSEA AFTER TONSILLECTOMY! I am currently on recovery day 5 after my tonsillectomy and I wanted to share my invaluable cure for postop nausea, and ultimately for vomiting. On day 2 I experienced considerable nausea and was very afraid of the pain associated with vomiting so I utilized a product I had discovered in the recent past for heartburn and nausea which I had been experiencing due to recently discovered food allergies. It’s called Mastic Gum and it can be purchased at health food stores or online and is inexpensive. (I get this in capsule form, not a chewable gum). It has antibacterial properties and aids in the relief of many digestive issues. I opened the capsule up in some applesauce and mixed it very, very well as it is a dry powder and I certainly did not want a choking/coughing fit. I am so relieved and happy to report that my nausea went away within minutes. It has so many gastrointestinal protective qualities that it will help protect your stomach from the damage of consuming pain medications given after this procedure, on a potentially empty stomach; not to mention any surgery-related nausea and nausea related to lack of eating. Anti-nausea medications repeatedly fail to properly treat nausea long term and fail to address the cause, but mastic gum addresses both of these. I really, really hope this helps!